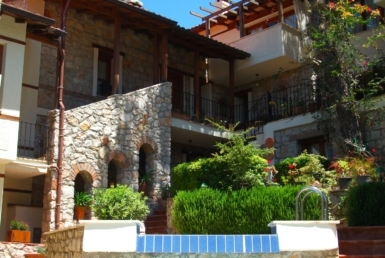 This beautiful stone built cottage is situated in one of the most beautiful areas in Fethiye. Steeped in history with the ghost town of Kayaköy, just a stones throw away. Once the Greek town of Karmylassos, it was abandoned in the 1920’s and stands today as a reminder of past times. Kayakoy is very popular in the summer months due to its natural cool breezes and beautiful countryside. Good restaurants and cafes serving traditional fayre are also a great attraction for tourists and locals. The nearest beach is Gemiler Beach approx 1 km away and offers crystal blue waters. Here you can relax on the beach, take tea at the local cafe, or if you are feeling adventurous partake in water sports in the summer months. Fethiye, with its working harbour is the nearest town, which is open all year round and is the place to go for your everyday needs, including banks, official offices and a wide range of shops and cafes. The old town still stands today and is a great place to browse for traditional goods or visit the famous Fish Market of Fethiye. The living space is open plan and is light and bright thanks to the ample windows and double doors leading out the the private pool area which is decked and surrounded by mature shrubs. A fabulous feature of the living area is the “nook” which is a seating area raised from the floor and filled with cushions and books. The kitchen is modern in design and has feature stone walls throughout. The units and counter tops are of excellent quality and come fully loaded with everything you need. 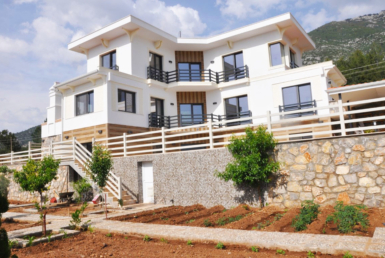 You are ready to go should you wish to choose this home as a permanent private home or as an investment as a buy to let property. 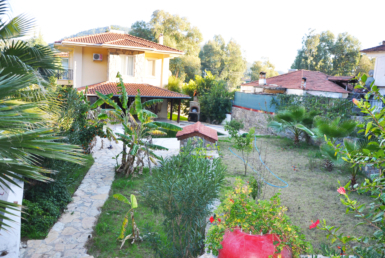 The bedroom is a double room and has en-suite facilities with 2 balconies overlooking the fabulous views of KayaKoy. The cottage comes fully furnished with all fixtures and fittings and has air-conditioning throughout. The design and traditional features of this cottage are second to none and there is a real feel of luxury inside this beautiful dwelling with its arched doorways and upstairs gallery. There are so many unique features to this property that a viewing is a must.